Rosemarie "Rosie" Henson MSSW, MPH is senior vice president for prevention and early detection, a member of the Society's Cancer Control team headed by Richard Wender, M.D. chief cancer control officer. She brings more than 20 years of public health leadership experience to this position with major contributions in cancer control, tobacco control, childhood obesity, viral hepatitis, health disparities and global health. Previously, Henson served as senior advisor to the assistant secretary for health at the U.S. Department of Health and Human Services (HHS), Howard Koh. There, she was responsible for key national and global policy issues, strategic initiatives, and collaborations with external organizations. She directed department-wide efforts to develop HHS strategic action plans on several priority public health issues, including tobacco control, viral hepatitis, health disparities, and colorectal cancer. Henson co-led the department's year-long activities and strategy to prepare for the 2011 United Nations High-Level Meeting on Non-Communicable Diseases. She led the HHS team that published and released the 50th Anniversary Surgeon General's report: The Health Consequences of Smoking-50 Years of Progress. In May 2014, the team received the Secretary's Award for Meritorious Service for this significant accomplishment. Henson also worked at the Centers for Disease Control and Prevention (CDC), where she held a variety of leadership positions. She is the former deputy director of the National Center for Chronic Disease Prevention and Health Promotion with the mission of advancing the prevention and control of chronic diseases. In partnership with the center director, Henson directed the Center's 10 scientific divisions with 1,400 employees and an annual budget of almost $1 billion. She is credited with strengthening the Center's portfolio of prevention programs through enhanced collaborations with state health agencies and national partners. In addition, Henson served as the director of CDC's Office on Smoking and Health from 2001 to 2004 and directed CDC's National Breast and Cervical Cancer Early Detection Program that has screened millions of underserved women across the nation. 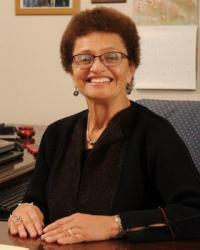 Henson holds a master's degree in public health and a Master of Science in Social Work from Columbia University. She has been the recipient of several prestigious awards, including the Presidential Rank Award for Meritorious Service in 2007; the Surgeon General's Certificate of Appreciation for Exemplary Efforts for the landmark Surgeon General's Report on the Health Consequences of Involuntary Exposure to Tobacco Smoke in 2006; and the Jeffrey P. Koplan Award for outstanding leadership in global tobacco surveillance.